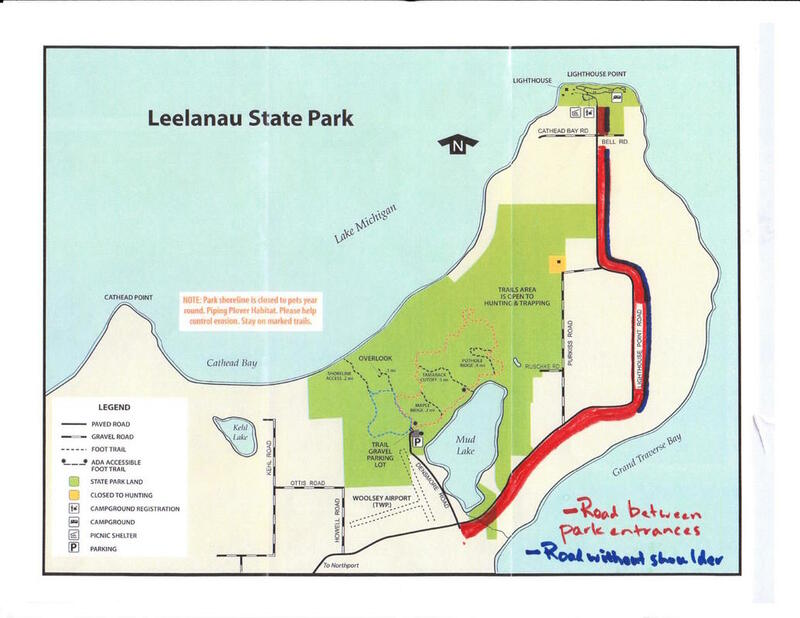 Pl"The 4.6 miles of road between the two sections of the Leelanau State Park south entrance and the entrance to the Lighthouse Park/camping area are a beautiful drive. They are also an ideal pathway for bicycles, runners, and walkers to travel between the two sections of this park. Because of the road’s flat nature, it becomes a default road for casual and younger/family bikers who need to avoid the hills on other roads. However, 2.2 miles of this road are unsafe for sharing in their current form. They have no hard shoulder (from the Cherry Home Subdivision to the Lighthouse/Camping area entrance). They are along a curvy road with blind corners. They have a speed limit of 55 mph. They attract many drivers who are unfamiliar with the road. We propose that putting in hard shoulders in this 2.2-mile section needs to become a top priority for the Leelanau County Road Commission for safety along this road. This is critical for public safety. No driver would ever want to injure a biker or a runner, but the chances of such are increased when there is no hard shoulder available. This road has “blind spots” which justifies hard shoulders being present. The risk of injury is even higher when the road has hard shoulders and then suddenly doesn’t, as is the case with this road. This is true whether you’re going to or leaving the Park. This will reduce liability. Without hard shoulders on the road to the Park, and especially the part between its two sections, an “attractive nuisance” is created. It is misleading the public beginning a ride to or “in” the Park when the road isn’t safe enough the whole way. Enhancing the County road to the Park will increase opportunities for more people to enjoy all that the Park has to offer and in a safer way. For the safety of drivers, walkers, and cyclists, we also propose that adequate signage be posted to make this curvy road safer and that a change to the speed limit be considered during the busy summer months. If you drive this while cyclists are on the road, you will see this is necessary even after shoulders are in place. Please help us keep everyone safe...drivers, bicyclists, runners, walkers, families, children, and adults. Please join us in asking the Leelanau County Road Commission and the Leelanau Township trustees to make this a top priority project to be completed as quickly as possible."